If you want to add a little extra to that special occasion, why not hire the famous Felling Male Voice Choir? Whether a concert, wedding, a corporate event or a celebration of any sort, we can provide some musical magic and make it a day to remember. For anything outside of our large repertoire, we can usually accomodate, given sufficient advance notice. Due to the many varying requirements, it’s not possible to quote specific costs on this website. However, you’ll be surprised at how affordable hiring Felling Male Voice Choir can be. Let Mike know what you want and we’ll take it from there. 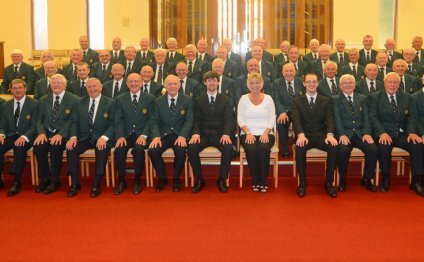 Tideswell and Felling Male Voice Choirs, "American Trilogy"